T-Online TV: Deutsches Hulu durch die Hintertür? In the last weeks more and more hints can be found that the American video streaming service Netflix will enter the German market in the close future. The service is really successful in the US outperfoming HBO in subscriber numbers. But what will happen if they come to Germany? 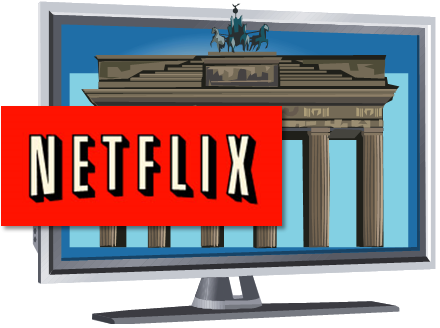 Which impact could the launch of Netflix Germany have on German TV producers and TV channels? In this articel I describe what I think is likely to happen. Since a long time German TV producers are looking for ways to gain independency from German TV stations. By now channel groups like Mediengruppe RTL, ZDF and ProSiebenSat.1 are their only customers and therefore have a high bargaining power. Bigger production companies have already tried gaining independency by marketing their own content online (e.g. UFA’s webseries „Pietshow„). However, those case studies are far away from delivering significant returns-on-investment. And now Netflix comes. This video-on-demand service has proven not to consider itself to be just some secondary part in the value chain of content distribution but to order high quality series like „House of cards“ directly from producers instead. For German producers this is a sign of hope. Rumors are that they are already trying to get in touch with Netflix. But just how likely is it that the producers here in Germany will really profit from Netflix entering the market? I don’t think they are really high. Why? Because Netflix with its international expansion plans will heavily bet on one economic advantage: Economies of scale. The investments on own content will pay off better the bigger the distribution area is. Therefore they need content that works internationally and chances are that they will rather bet on American production companies for that purpose. On the long run and if Netflix really becomes successful in Germany there will certainly be an impact on the TV channel’s bargaining power but concerning the content I think German productions will only be relevant in Netflix’s long-tail. To evaluate the impact on German TV channels let’s look into Netflix’s past first: Netflix used to be a video rental store sending DVDs and Blu-rays to its customers. When they realized that their business would be disrupted by video streaming they decided to be the disruptor instead of being disrupted and started the online service. Many experts say that video-on-demand will not only disrupt DVD distribution but will also have an impact on traditional linear TV. If this is true the channels would be wise to invest in video-on-demand instead of being disrupted by other companies like Netflix and that’s why some German channels like ProSiebenSat.1 already do invest in it (Maxdome). I don’t think the linear TV will ever die (see my 2011 articel about TV usage 2016 for example). But what will happen is that at least the consumption of fiction will more and more shift from linear TV towards video-on-demand. The main drivers for this development will be the streaming providers‘ pricing models (flatrate), the increasing ease of use (smart-TV and mobile) and the recommendation engines that will more and more take over the task of selecting the right movie out of a huge choice (which I think still is a problem today – this might be a solution). Therefore at least channels that are heavily dependend on (imported) fiction should have a clear strategy on how to deal with the shift towards on-demand streaming. They should be the disruptor and invest in SVoD instead of being disrupted – even if that means burning cash and harming their own business model at first. New competitors like Vivendi’s SVoD-service Watchever are already trying to profit from the first-mover advantage and want to become big before Netflix enters the German market.